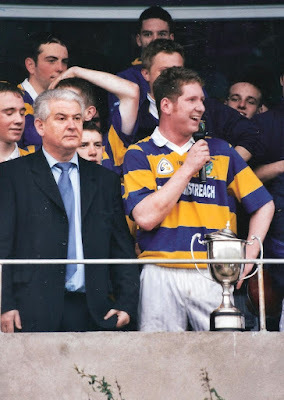 This week's photo shows John Hurney making the captain's victory speech following a seven point replay win over Ballygunner in the 2004 County U21 'A' Hurling Championship Final played at Fraher Field. Thus began a very successful era for the club at this grade, it being the first of three titles in four years. Our Under 12 team hosted Dungarvan at the club grounds in the second round of the Town and Country League. Our lads started off very well and continued to play well right throughout the game and won at the final whistle. Our next game is against Cois Bhrid in two weeks time in Tallow. Training continues on Mondays and Fridays at 7. The panel was: Dylan O'Regan, Charlie Gough, Oisin Brazil, Andrew Norris, Jack Kiely, Michael Walsh, Fergie Slevin, Charlie Treen, Jack McGrath, Rian Cosgrave, Edmond Spratt, Seanie Callaghan, Rory Tyrell, Tomas Nee, Conor Bohane, Aidan Higgins,Mark McCarthy and Eddie Phelan. We play against St Pat’s this weekend in our first Town and Country League match. A report on this match will be available here next week. Our weekly juvenile training sessions for five to nine year olds continues this Saturday morning between 10.30 and 11.30. Our camp for the kellogs Cul camp this year is from the 4th to the 8th July. This is always a great camp and we always have big numbers attending. To book your place on this camp you can do so online on www.kelloggsculcamps.gaa.ie. You can now check out the new facebook page Abbeyside/Ballinacourty and camogie Féile 2016 for updates on the upcoming Féile news. A big thank you must go to Sharon Kiely for setting this up. Our Under 8 team took part in a football blitz in Carriganore on Saturday morning last. The kids had a great day out and the day seemed to be enjoyed by all. Special thanks must go to the parents who travelled on the day. Training continues for this group on Saturday morning at 10.30. We played the Under 14 Féile Football semi final on Friday last against Gaultir. We tried hard throughout the game but in the end we lost out to a very strong city team. We beat Gaultir last Monday night in Abbeyside in the Under 16 Football Championship on a score line of 2-15 to 1-6. This win has qualified us for the semi finals which will be played on Sunday 8th May. Our Under13 football team got a walkover against Tramore at the weekend and our next match here is against Stradbally next week. If we win this game we will have qualified for the semi final so we wish all the lads well. Our under 10 team are still training hard for their upcoming annual Ballyduff tournament. We had five representatives on the county minor football panel that lost out to All Ireland champions Kerry in the Fraher Field on Wednesday two weeks ago. On the night Waterford lost out to an extremely strong Kerry team who are going for a three in a row of All Ireland titles. The lads lost nothing in defeat and acquitted themselves well on the night. The players involved were namely James Beresford who captained the team, Aoron Beresford, Tony Collins, Sean Whealan Barrett and Tom Looby. My sincere apologies to all concerned for the omission of this piece last week. They play Limerick tonight Wednesday in Leamybrien in the next round and we wish all the lads well and hopefully a large turnout from Abbeyside/Ballinacourty will be present on the night. Well done also to Neil Montgomery and Darragh McGrath who were involved with the county minor hurling team on Saturday last where they had a great win over Tipperary at Walsh Park. Well done lads. On Saturday evening last our U16 girls were out in their second championship match against Portlaw. This was a very fast moving game with the girls coming into their stride. Portlaw being an older and more experienced side ran out winners. There will be no more games for U16 until after the Junior Cert. On Tuesday evening our U14s travel to Clonea to take on Clonea Power in their second game of the championship. This has a 7.00pm throw in. Our U12s get their blitz action under way for 2016 on Saturday next in Ring. All relevant girls are requested to be at Ring GAA pitch for 10.30am. Training continues this Friday evening for U6s to U12s from 6.00pm to 7.00pm. New members are always welcome. Helmets & hurleys can be bought through the club at a discounted price. There will be a Feile committee meeting on Thursday evening at 7.30pm in the club house at 7:30pm. All relevant people are requested to attend. Abbeyside Players (L to R): N. McGovern, J. Hogan, L. O'Dea, P. Clancy, P. Whelan, T. Collender, P. Browne, L. Whelan. This week's photo comes from 1955 and shows the Abbeyside and Mount Sion teams in the pre-match parade in a game for the benefit of Abbeyside School's Building Fund. The match took place just a few weeks after the tight County Senior Hurling Final which the same teams contested. This time however, Mount Sion ran out comfortable winners on a scoreline of 9-6 to 1-4. Our ever popular Jack the Joker fundraiser continues this Sunday night in Alice O’Connors where the jackpot is €4,400 as on Sunday night last Mai Donnelly was drawn out of the drum and chose card number 39, which when turned was not the Joker though she did win €50. Jack Kiely and Aidan Landers won €25 each. As well as our group of ticket sellers tickets can be purchased from Convenience Store Ballinroad, Village Flowers, Spar, Mousies Takeaway, Minnies Bar, Abbeyside Post Office and Crotty’s Corner Bar. We played out first match in the County Senior Championship on Friday night last when we took on Ring in Fraher Field. Trailing at half time by 3 points we played much better in the second half to lead by a point with time almost up, but Ring pointed in injury time to earn a deserved draw. This Saturday night we play St.Saviours in Kill in our second game of the championship. Bizzarely our request to play this game mid week this week was turned down by the CCC despite clubs being told that mid week games will have to be played to finish the Championship. So while all the other clubs in the Senior Hurling Championship prepare for the Championship by playing Sargent Cup games this weekend we will be playing a football match we offered to play Tuesday or Wednesday night. It will be interesting to see how consistent the County CCC will be with fixing games mid week in the months ahead. On Wednesday night last we played Modeligo in our pitch, the second round of the Western Championship. A much improved performance by the side form their first round game saw them earn a hard earned draw on the night. Our Junior Footballers, who are this year taking part in the Western Premier Junior Football Championship, got their campaign under way on Saturday afternoon last when they took on Colligan in Dungarvan. In the first half we found the step up from last year hard to handle as Colligan led convincingly at half time. However in the second half the team played much better to show that they are capable of competing at this level in the months ahead. Our club bingo will continue this Sunday night in the CBS Hall with a jackpot of €1350. All in the juvenile club would like to congratulate all the children of the parish who were confirmed on Friday last. Our Under8 football team take part in a blitz on Saturday morning next in Carriganore at 11 am. Hopefully all the lads will enjoy the experience. We played Killrosanty in the Under 14 championship on Sunday morning last. This was a very competitive game throughout and at the end of the hours play the game ended in a draw which was overall a fair result. Our next game here is in the Féile semi final where we take on Gaultir on this Friday night coming. We wish all involved the very best of luck. Our Under13 football team had a great win in the championship on Wednesday night last where they defeated an unbeaten Gaultir side. This was a must win game for our lads who had lost their two previous outings. However all credit must go to our team who showed great determination through-out and deserved their victory in the end. The next game for this group will be on Sunday morning next the 24th where they will take on Tramore. It was a quiet week for the Under 10 team last week and they will continue training away at their usual times. Unfortunately the Town and Country League did not start for our lads on Friday night last as Dungarvan were not able to make the trip on the night. Hopefully this game will be rearranged soon. Our next opponents in this age group are Saint Pats and training will continue as usual on Friday night between 6 and 7. We wish to thank Barry Dunne from the Coaching Games and Development Committee for helping out with the training session for the Syrian boys and girls who once again visited our club on Saturday morning last. Also thanks to Paul, Joe, Pat and Audrey for their assistance. The children thoroughly enjoyed the session and are showing great enthusiasm for the skills of our national games. The juvenile club are holding their annual bag pack fundraiser on Thursday 2nd, Friday 3rd and Saturday 4th June in Garveys SuperValu. This fundraiser is vital to raise adequate funding for the juvenile club and all parents are asked to help out volunteering their time. We respectfully ask parents to volunteer two hours on any one of these days to achieve a successful outcome. Please contact our juvenile secretary Audrey on 087(6987388) if you would be willing to help. All help would be very much appreciated. Thank you. On Tuesday evening last our U14s played their first championship game of 2016. This was a very competitive game with plenty skill on show, the girls got off to a very good start with their first score coming from Moya Kiley. Ring, being a very strong side, were the winners on the night. This Tuesday evening it’s back to U16 against Portlaw. This was to be an away fixture but due to Portlaw’s pitch being unplayable, Abbeyside will host throw in for this game is 6:45pm. This is the last game for U16 until after the Junior Cert. Our U12s will travel to Ring on Saturday, 30th April to take part in their blitz. Training will take place as always for U6 to U12s every Friday evening from 6.00 to 7.00pm. New members are always welcome. Membership is now overdue and we would ask that all membership forms are returned asap. Congratulations to all our members who received the sacrament of confirmation over the weekend. Back Row (L to R): Richie Foley, Patrick Hurney, Brian Scanlon, Seán O'Hare, Eoin Brackett, John Gorman, Diarmuid O'Hare, John O'Driscoll, Stephen Lanigan, Stephen Enright, Mark Gorman. Front Row (L to R): Mark Ferncombe, Brendan Walsh, James O'Mahony, John Kindregan, Daryl Ryan, Joey Mullen, Tiernan Murray, Mark Fives, Jamie Ryan, Donal Henley, Richie Ryan. This week's photo comes from 2007 and shows the Abbeyside team, wearing Ballinacourty jerseys, who beat Lismore 2-12 to 2-7 in the Western U21 'A' Hurling Championship Final played at Fraher Field in November. 1-4 from Mark Fives and a goal from Tiernan Murray set the lads up to retain the title won the previous year. Our ever popular Jack the Joker fundraiser continues this Sunday night in Alice O’Connors where the jackpot is €4,200 as on Sunday night last Kay O’Connor was drawn out of the drum and chose card number 26, which when turned was not the Joker though she did win €50. Neil Moore and Louise O’Donnell won €25 each. As well as our group of ticket sellers tickets can be purchased from Convenience Store Ballinroad, Village Flowers, Spar, Mousies Takeaway, Minnies Bar, Abbeyside Post Office and Crotty’s Corner Bar. Our Senior Football Championship match against St. Saviours on Sunday last was postponed due to an unplayable pitch. This Friday night we play An Rinn in Fraher Field at 8pm. On Friday night last we played The Nire in Fraher Field in the first round of the Western Championship. On the night our opponents proved to be too strong and ran out deserving winners. This Wednesday night we play Modeligo in our own pitch at 8pm. TEAM: K. DWANE, G. BREEN, D. HENLEY,C. O’DWYER, J. DUGGAN, E. ENRIGHT, K. DEE, L. HURNEY, N. DEE, A. O’CONNOR, M. GORMAN, R. RYAN, D. FERNCOMBE, J. O’BRIEN, E. KIELY. Like our Senior Footballers, our Junior team saw their game against Old Parish last Sunday postponed due to the weather conditions. This Saturday we play Colligan at 3pm in Dungarvan. On behalf of all in the club we would like to congratulate Darragh McGrath and Neil Montgomery for being selected on the Waterford Minor Hurling Team last week against Cork. Donncha Enright and Pat Moore were also part of the backroom team, and whilst defeat was their loss on the night they now play Tipperary in the losers group section of the Championship. Our club bingo will continue this Sunday night in the the CBS Hall with a jackpot of €1300.